Tanya Bonakdar Gallery presents Solar Rhythms, a solo exhibition of new works by internationally renowned artist Tomás Saraceno, on view from Saturday, April 14 through June 9. Solar Rhythmssuggests a model for a landscape that balances our relationship with, and harnesses the unlimited potential of the Sun. This realization requires a thermodynamic leap of imagination, just like during an eclipse, when only in the absence of light do we become aware of our scale in the shadow of the cosmos. In that moment of alignment between Sun, Moon and Earth, we understand that we rely on a reciprocal alliance between the elements and effects, the shifting winds, the exchange of heat and momentum, and the diffusing reflection of solar radiation towards the cosmic extent. For his sixth solo exhibition at the gallery, the artist presents a series of new sculptures and installations that emerge from the artist’s ongoing Aerocene project. Aerocene was initiated by Saraceno in 2015 as an interdisciplinary artistic endeavor that seeks to devise new modes of sensitivity, towards an ethical collaboration with the Sun, the atmosphere and our environment. The first work to engage viewers, at the gallery reading desk -- the Aerocene Float Predictor -- is a trajectory computation and visualization developed by Glenn Flierl, Lodovica Illari and Bill McKenna from MIT in collaboration with Aerocene Foundation, during Saraceno’s visiting artist residency at the MIT Center for Art, Science and Technology (CAST). The Aerocene Float Predictoruses wind forecast data from the US NOAA Global Forecast System, inviting visitors to generate their own fossil fuel free flight trajectories around the world, based on the wind patterns each day. Floating like this would provide an alternative to the linear vector flight of propulsion technology, replacing it with elemental choreography in the atmosphere. Positioned next to the Aerocene Float Predictor is the Aerocene Explorer - a tethered or free-flight starter kit, which enables anyone to launch their own Aerocene solar sculpture. A tactile and engaging way of experiencing Aerocene, the backpack allows us to engage with the atmosphere. Working with different communities, the project has grown in multiple directions, collecting atmospheric data using non-intrusive, emissions-free scientific exploration tools that measure air quality, temperature, humidity, and pressure. Additionally participants can ‘hack’ the device pack to create their own lightweight sensors. Some of the Aerocene sculptures developed by Saraceno and the Aerocene Foundation are inspired by scientific experiments that the French National Space Agency conducted in the late 1970s – particularly the infrared radiation balloons. During his residency at the agency in 2012, Saraceno pursued this research, forgotten for decades, and here presents modeled versions of the larger structures. Inflated only by air, lifted only by the Sun and carried only by the wind, these inflatables sculptures challenge socio-political atmospheres by trespassing and weaving new, much needed aerographies. Able to travel for more than three years around the world nonstop, Aerocene moves our imaginations towards a post fossil fuel era. Such a project could open up the boundaries of the Earth, and Saraceno suggests, would open a new, interplanetary ecology of practice. We could reconnect with elemental sources of energy and form a new set of values that would overcome the extractive economies of the fossil fuel regime - a new stratigraphy of the future. These concepts manifest in the form of a diptych of large-scale inflatable orbs, Aerocene Constellation 3/2, which serves as the centerpiece of the exhibition. Surrounding the pair of floating Aerocene orbs are a series of hanging sculptures. A work comprised of hand-blown glass spheres is titled Calder Upside Down 35/20/18/12/8/6 (the numbers tautologically referring to the diameter of each spheres, in centimeters). The forms are influenced by the legacy of Alexander Calder, an important and inspirational figure for Saraceno, while at the same time question the tradition of Modernism and its role in the ecological crisis we find ourselves in - the Anthropocene era. The spheres are held in gentle orbit, embodying lightness yet restricted by gravity. This is echoed by the beautiful shadows the works cast on the surrounding walls. The remarkable light refractions translate and suggest the passage of time, resonating in the delicate filaments reflected from Aerocene Constellation 3/2, evoking the planet’s meridians as it spins on its axis, and also possible journeys that we can take as we become airborne within the ocean of air. As viewers move through the large gallery, casting their own shadows, they become a part of the floating landscape. In the rear gallery downstairs, the visitor encounters the installation Sounding the Air. Composed of interwoven threads of spider silk, the work refers to the phenomenon of ‘ballooning’, which sees spiders release threads into the air, their silk becoming a means to travel over thousands of kilometers. Floating out of nothing, spiders have already learned how to read the air, finding their way among the thermals and currents to reveal not only the fabric of the atmosphere but of the cosmic web of infinite connectivity our planet sits embedded within. A video camera documents the undulating movements of the fine lines of spider silk, illuminated by beams of light supplied by three spotlights - the visual data is relayed to an audio interface which translates the movements of the silk threads into sounds that fill the space - chaotic, crackling and rumbling melodies, hypnotizing the viewer who watches the lines dance, while specks of cosmic dust circulate around the room. In the small gallery upstairs, two projected works play, one after another. The first, Aerocene, launches at White Sands, NM, United States, details the launch of the D-O AEC Aerocene sculpture, filmed at White Sands, New Mexico, the same place where the first nuclear bomb was tested, an event that marked the beginning of the Anthropocene epoch. The date of Saraceno’s launch - November 8, 2015 - marks the beginning of the new Aerocene epoch, breaking two world records with the first and the longest fully solar, certified flight by a lighter-than-air vehicle. During approximately 2 hours and 15 minutes, seven people were lifted up in the air without the need for any helium, propane, rocket propulsion or radioactive explosions. Saraceno recalls, gravity seemed to upturn, moving with the wind in complete stillness-in-motion. At this moment, there is no up or down anymore, as the wind and air combine, you start falling upwards in elemental motion. A second video work Diving into the Ocean of Air, records a crew of sociologists, artists, radio amateurs, and members of the local community flying eight Aerocene Explorers over Salinas Grandes salt lake in Jujuy, Argentina. The lake has become the site of an extensive lithium extraction industry, lithium being an important resource for the future of the energy industry, threatening the surrounding indigenous communities and the delicate balance that maintains this ecosystem. Aerocene carries a message of simplicity that seeks to overcome the governance that dominates the ground and that has been extended to the air, without considering the freeing possibilities of the atmosphere. Positioned under the skylight in the main gallery upstairs, Saraceno presents experiments with hand-blown glass, conveying the vision of Cloud Cities via the tangible logic of Aerocene. Soap bubbles made of glass form constellations, blown through geometric structures inspired by the Weaire-Phelan model. These membranes contain the Pneuma, denoting breath, the spirit of which, like the wind, is invisible, immaterial and powerful. Breathing in and out, air becomes the binding medium, through which everything transmits and is shared, connecting the visitors to the resulting cacophony of delicately shifting reflections. 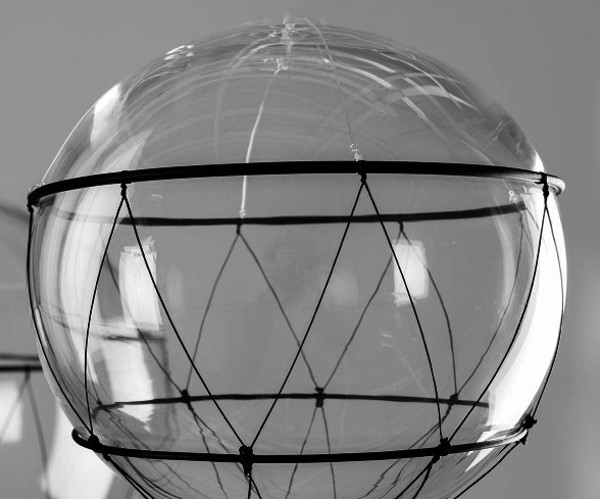 Another work features a small glass sphere held together by the mutual tension of two flexing carbon rods, and a network of polyester strings. Titled RAY 1080, Saraceno directly references the speed of light (in millions of kilometers per hour) highlighting the connections drawn between all celestial phenomena, as a ray of light. The forms can also be read at an atomic level - as electrons and protons that exist as the building blocks of all matter. These shifts in scale have predominance in much of Saraceno’s oeuvre, and again we are reminded to consider the imaginative potential that sees the microscopic simultaneously with the cosmos. Making tangible this invisible web of relations, Saraceno invites the visitors to engage collectively in this exercise for planetary attunement. Saraceno lives and works in and beyond the planet Earth and this October will present his largest solo exhibition to date as part of the Carte Blanche series at Palais de Tokyo, Paris, taking over of the entirety of the museum’s exhibition spaces.